Despite our best efforts, we are all prone to human errors. The most common errors, of course, are typos – typos in document numbers and dates. Our error-checking I-9 compliance tool assists the user in identifying such mistakes. With document numbers and expiration dates playing such a major role in establishing eligibility for employment, even minor typos may become major compliance issues. Our tool provides prompts to assist users in correcting such errors as the form is completed. Ease of use was a high priority when we designed our I-9 compliance software. One of our goals was to allow Form I-9 to be completed right the first time at each hiring site. Thus, our user interface reflects the Form I-9 itself. 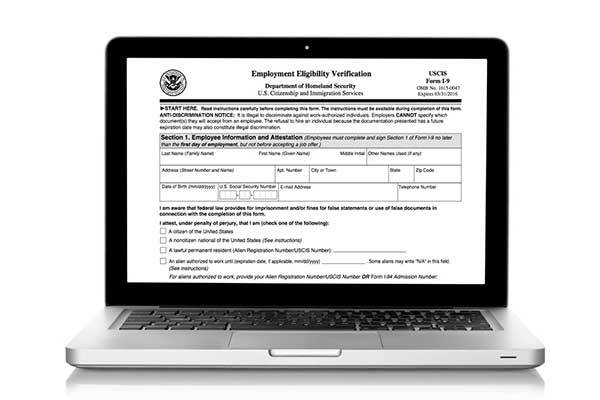 The familiarity of the form coupled with the completion prompts and error notifications makes error-free Form I-9 completion possible by any employer representative. Expiring documents and retention expiration dates are key dates in maintaining your I-9 compliance program. Our Form I-9 compliance software tracks expiring documents and provide advance warning of upcoming re-verification deadlines. You no longer have to identify tracked records and create internal tickler systems, all of the dates and notifications are managed for you through the tool. Management needs to be able to view Form I-9 compliance activities to determine program success. Our software includes many reports to allow you to confirm I-9 completion, determine process or training issues, track expiration dates, and to assess and cure current liabilities. These reports allow you to understand your I-9 compliance position for any snapshot in time, rather than waiting for an annual or bi-annual audit to know if all of your compliance goals are being met. Of course, nearly anybody, with a little bit of training, can handle entering a Driver’s License and Social Security Card in Section 2 quite easily. But use any other document or document combination and the probability of getting it right changes significantly. Our software anticipates uncommon scenarios and provides prompts and error notifications to make sure that even the most unusual circumstances are covered. Both federal and state laws require employers to ensure that new hires are eligible to work in the United States. If your company is found to be in violation of these regulations, you could face devastating financial penalties or lose your business altogether. Lookout Services’ I-9 Intelligence software streamlines the employment verification process. Not only were we the first vendor to offer software to aid with I-9 verification, but our web-based platform is more flexible than any other on the market and can be customized for your business. We take pride in focusing on the details in order to make the employment verification process as simple as possible. With intensive error checking technology and guided form completion, we’re here to help you get it right the first time. Most of our clients also appreciate our one-on-one support services, and our customer-first approach to doing business.